The federal budget deficit, a problem of enormous scope and magnitude, has led tax administrators at all levels of government to create new and innovative ways to increase revenues. The tug and barge industry has been particularly hard hit. The states, to make up funds no longer provided by the federal government, are becoming increasingly more aggressive in taxing waterway operators. In addition to navigation user taxes, we have been confronted with a wide array of state and federal fuel taxes and general corporate tax requirements. The tug and barge industry, in simple terms, is in a blizzard of taxes. 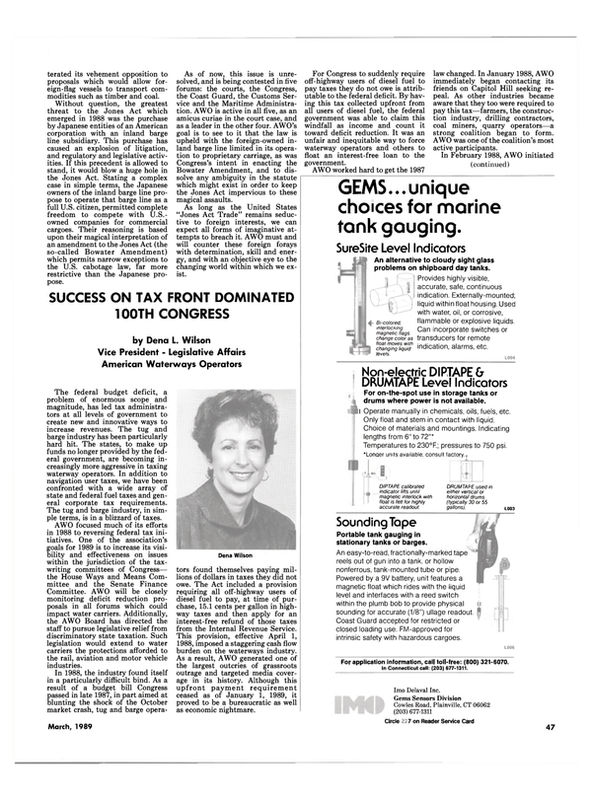 AWO focused much of its efforts in 1988 to reversing federal tax initiatives. One of the association's goals for 1989 is to increase its visibility and effectiveness on issues within the jurisdiction of the taxwriting committees of Congress— the House Ways and Means Committee and the Senate Finance Committee. AWO will be closely monitoring deficit reduction proposals in all forums which could impact water carriers. Additionally, the AWO Board has directed the staff to pursue legislative relief from discriminatory state taxation. Such legislation would extend to water carriers the protections afforded to the rail, aviation and motor vehicle industries. In 1988, the industry found itself in a particularly difficult bind. As a result of a budget bill Congress passed in late 1987, in part aimed at blunting the shock of the October market crash, tug and barge opera- tors found themselves paying millions of dollars in taxes they did not owe. The Act included a provision requiring all off-highway users of diesel fuel to pay, at time of purchase, 15.1 cents per gallon in highway taxes and then apply for an interest-free refund of those taxes from the Internal Revenue Service. This provision, effective April 1, 1988, imposed a staggering cash flow burden on the waterways industry. As a result, AWO generated one of the largest outcries of grassroots outrage and targeted media coverage in its history. Although this upfront payment requirement ceased as of January 1, 1989, it proved to be a bureaucratic as well as economic nightmare.